Modern laminate creates a stylish look in your home, but even better – it is quite hard to damage and relatively easy to care for! However, it’s still worth following a few basic guidelines to further maintain your floor’s beauty. Your floor should come with a set of care instructions and a warranty from the manufacturer. Carefully read and follow them and refer to them if a problem develops. Some laminate cannot be mopped within 48 hours of installation so please check on your particular floor. Don’t be wet, damp mop only. As puddles could seep behind baseboards and under your floor, we recommend you don't wet-mop laminate floors. Simply vacuum your floor then damp mop it. Never use polish, varnish or wax on your laminate. Most laminate flooring has a pre-finished wear layer, which doesn’t need further treatment. There are many laminate floor cleaners on sale today, many of which can actually lead to more damage to your laminate flooring over a long period of time. Your flooring manufacturer should recommend certain stain removers. It’s best to use only these. Typical suggestions are: acetone for cigarette burns and nail-polish spills; mineral spirits for grease and tar. You can prevent dirt and sand from entering your home by using good quality, dirt-trapping walk-off mats at key exit and entrance areas. On high traffic areas, rugs are a great idea for protection and can even enhance the overall look of your laminate. 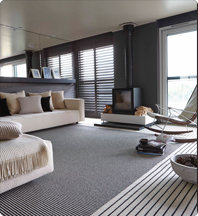 Use non slip rug underlay made especially for hard surface flooring to prevent accidents caused by moving rugs. Use easy glide protective buttons or felt protectors on the feet of your furniture. Stay on top of your floor! Regular cleaning should do the trick in keeping your laminate looking good. That and staying vigilant; wipe up spills and liquids straight away; don’t let liquids stand on your floor and, as dirt can be walked into your laminate, keep sweeping your floor as regularly as you can. Another way to avoid scratching your laminate is to never clean with abrasives, scouring powder or steel wool.